They say pictures are worth a thousand words, so I'll let them do most of the talking. We had a fun day yesterday. 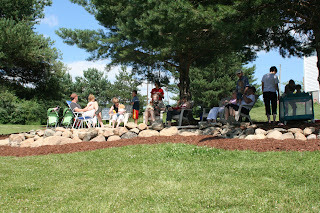 It was the quintessential Fourth of July with a BBQ picnic, fishing, roasting marshmallows on the fire and a wonderful family gathered together. The only thing missing was you. We miss you so much! We Tried Watermelon & Loved It! Great, Great Aunt Mary Lee Came From St. Louis To Hold Us! Why are you in the midwest for so long? Is this just a family visit? That first pic is something you would see on a real post card or calendar! Too cute! Your pictures tell a story of a wonderful family celebration, passing on the fun from generation to generation. And soon daddy can join in on the fun too. 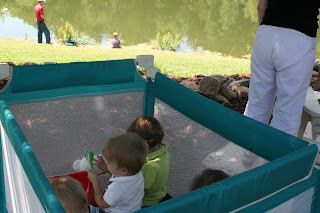 Looks like the Goerlich quads are getting so big and still so cute! Sounds like watermelon was fun and ya'll had a great fourth! Your "postcard" posts are so sweet. I kinda feel like I'm eavesdropping on you guys. The photo of Jaz pushing the stroller was a money shot! Hilarious. Chris, I hope you get to be reunited with your gorgeous wife and kiddos soon. Thanks for the great pics/videos and awesome humor! I'm loving these "postcards" too! Isn't that what blogging is for...eavesdropping?? lol. May you guys be reunited soon!!!! 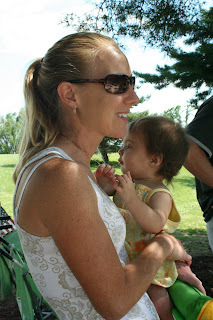 Love the pic with the Great Great Aunt. Cute! Not anony, just can't remember my user/pw and can't figure out how to change it, duh! Can you tell I'm not a blogger! We had fun hanging w/Chris over the wkend, but sure missed you!! WE are looking forward to seeing you & the babies soon. 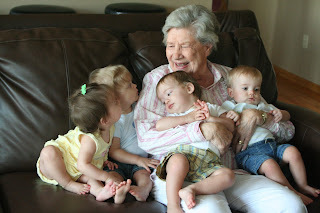 Love the picture with the babies and their Great Great Aunt Mary Lee...precious!